Thunderstorms Thursday afternoon dumped rain across the northern end of the Big island and left a dusting of snow on the summit of Mauna Kea. National Weather Service forecasters had issued a flood advisory for South Kohala and North Kona as radar showed rain rates in the 1- to 2-inch per hour range, with the heaviest rain near the Saddle Road junction at about 3 p.m. The rains, caused by daytime heating, eased by early evening and the advisory was canceled by 6:30 p.m.
Mauna Kea is nearly 14,000 feet (4,200 meters) above sea level, making it the highest peak in Hawaii (and if measured from the seafloor, it’s the tallest mountain in the world). This mountain is known for snow — its name means “white mountain” in Hawaiian. According to Hawaiian mythology, Poliahu, a goddess of snow, lives here. Snow can fall on the summit year round, including summer. 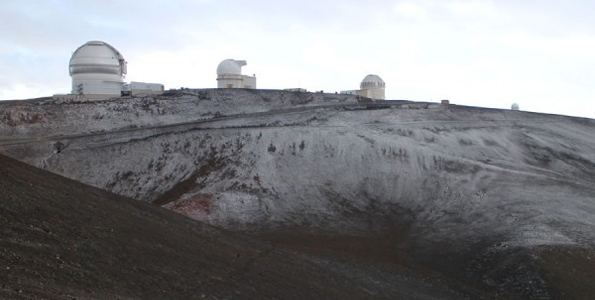 In June 2011, Mauna Kea had its first June snowfall in three decades.